Are you looking to make an impact while looking for that special unique gift for your loved one this year? Small businesses often are overlooked by customers who are enticed by larger companies, and this can adversely affect the local economy in more negative ways than might appear on the surface level. The rise of shopping malls and large chain stores such as Walmart and other retailers has caused irreversible damage to Main Street in the last half-century or so, and it’s paramount to remember the importance of supporting local small businesses. This year, why not give the gift of self care that keeps on giving while also calling to attention the importance of shopping at the small businesses that serve as the backbone of the American economy and our local communities? As a consumer, you can choose to also be a game changer and a wellness ambassador. You can accomplish this by choosing to support your local small business rather than the big box stores. Not only are you supporting small businesses this holiday season, you are bringing wellness to those you love by supporting my mission here at Healing With Spirit. Please join us this Saturday. Step away from your daily stresses. Warm yourself and sip on some herbal tea. Scroll below for a sampling of specials being offered. 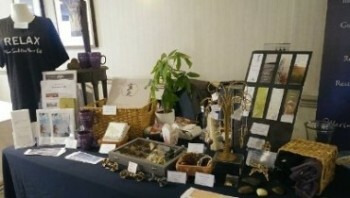 Take 10% off ALL items for sale. We are located inside Cohasset Medical, 256 Hull St, Hingham, MA 02043 next to the 7-Eleven strip plaza on Rte 228 before Nantasket Beach. *Restrictions apply. While supplies last. 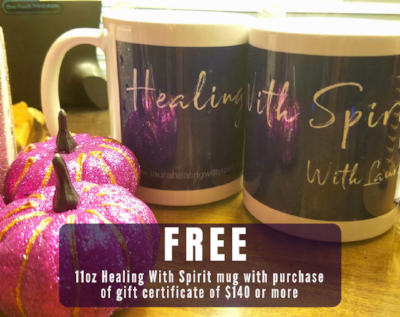 Purchase any gift certificate w/ a value of $140 or more & receive this fabulous 11oz Purple Healing With Spirit ceramic mug FREE. *Offer can not be combined with any other offer. While supplies last. 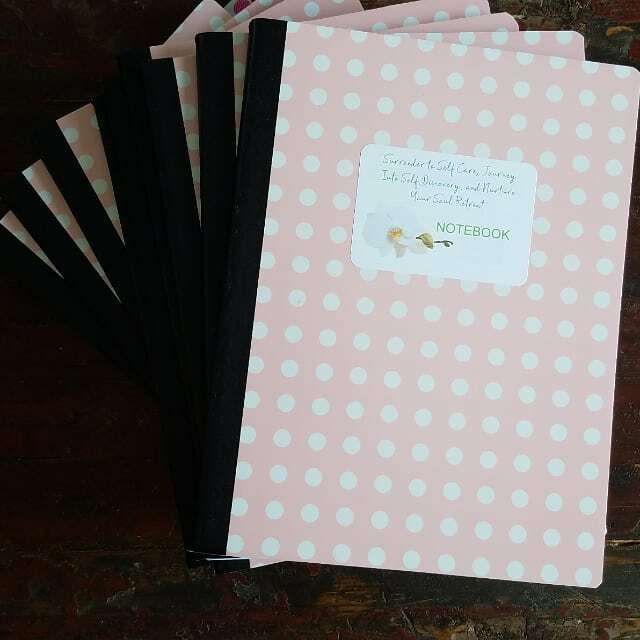 A perfect unique gift with a perfect reminder to give a loved one this holiday season with a fabulous message and reminder. 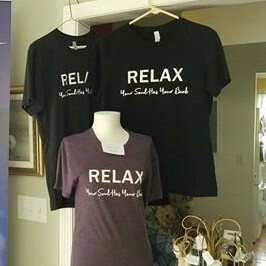 T-shirts fit true to size and no worries for shrinkage. 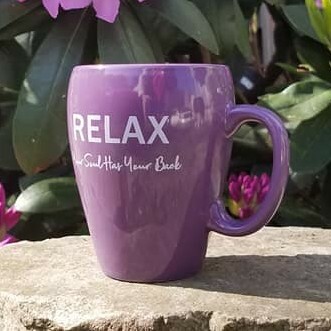 MUGS*: 10oz purple ceramic mug. 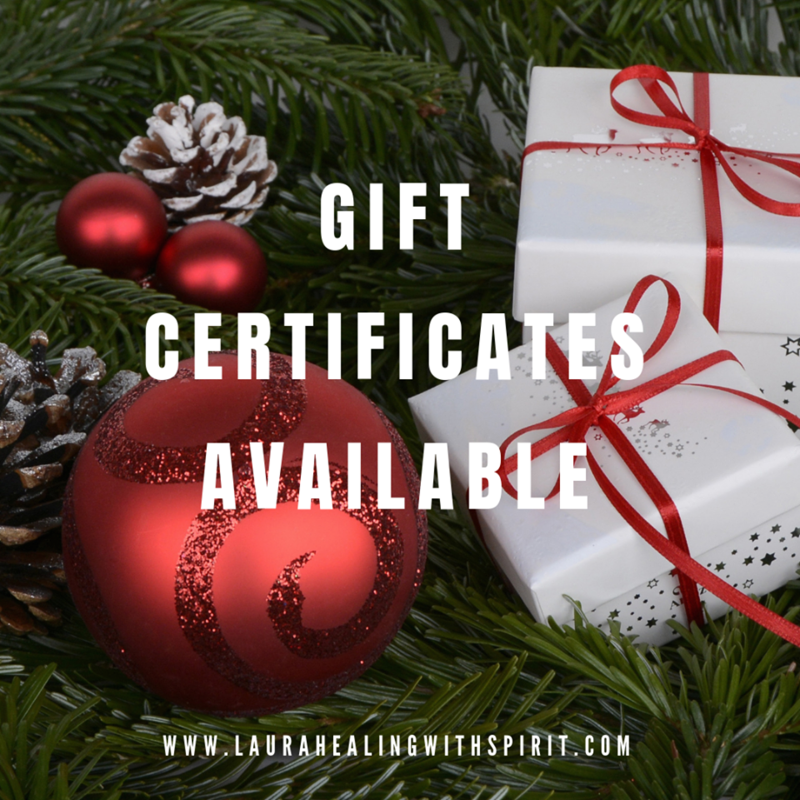 Purchase any gift certificate with a value of $70 or more and receive a FREE 11″ x 17″ spiritual art print photographed and written (with channeled messages) by Laura Joseph. Contact Laura 857-880-0365 or email her TODAY for your gifts. 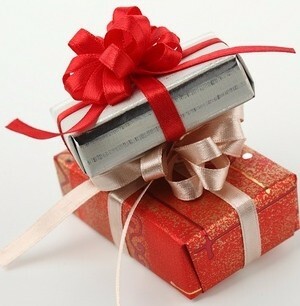 We also offer shipping and gift wrapping services as well. Mission #1: One of my missions is to help others step into their power, facilitate their own healing, and reduce medical waste that is one of our greatest polluters including the unnecessary need for medications that lead to addictions. Not all illnesses can be improved by the traditionally as many are starting to understand. Let me help be a bridge for you. Mission #2: I have a passion to be a catalyst for healing the epidemic of the underlying current of trauma deeply seeded in our subconscious minds and in our culture that negatively affects every aspect of our lives and steals our joy and well-being. In my opinion, unhealed or repressed trauma is the greatest economic toll and human health crisis in our modern society linked to poverty, violence, mass shootings, injustice, abuse, job loss, poor health, and more. Mission #3: I also want to be able to use my voice and advocate for change using my story, my spiritual practices and disciplines, and my training to help others heal when they have been told to “just live with it”. I created a Facebook page this year and an Instagram account called “Healing Trauma Through Spirit”. Please support these pages and share with loved ones. Mission #4: I want to create a scholarship fund targeting 2 demographics: for those faced with end of life and the other healing from trauma associated with abuse like domestic violence so these individuals do not have to go without healing services when it matters most and can change a life. I need the help and support of the community to make this happen. I will need volunteers to help make this vision become a reality – lawyers, accountants, business, etc. This was a video recorded live through Massachusetts Survivors Outreach Facebook Page on Nov 25, 2017 as a follow-up from the first “Today, I Bless My Junk” which can be found on Youtube. What I share with you is raw, real and pure stemming from my years of healing trauma associated with abuse. These video series were inspired by all the recent events of the media finally choosing to cover many of the abuses women have been faced with and silenced. Tips for survivors on managing triggers, how to bless your junk, and how to let your junk empower you back to you to wholeness. Are a survivor? Empath? A loved one of a survivor? Bystander? Please join us. There is so much in store for you I have planned and so much that I am thankful for. I believe in partnering not only with my soul and spirit team, but with you. Thank you for being a part of my spiritual journey. We are all connected in some way whether in person, blood, or internet. The past few days I have been reflecting a lot of what 2015 has meant to me and to those I have served. It has sure proven itself to be one giant roller coaster ride. Wouldn’t you agree? I would love to hear from you what your experiences have been, and what you discovered and learned about yourself. Please check out my latest blog post, Reflections as We Close Out 2015 – 5 Lessons 2015 Taught Me, and as always I would love your feedback. Regardless of what holiday you celebrate or religious affiliation, the holiday season in itself is a time of giving and thanks for what we’ve been given and to give back. The Gift of Healing is a great way to show your loved ones you care. Who doesn’t love the look on someone’s face when they open something special from you? But… if we’re honest with ourselves… about half of the stuff we buy won’t be used in any meaningful way. So this year, instead of buying your loved one a gift from the mall, what about giving them a gift that will change someone else’s life? Why not give the gift of health, healing, and self-care. with purchase a gift certificate of $100.00 or more. 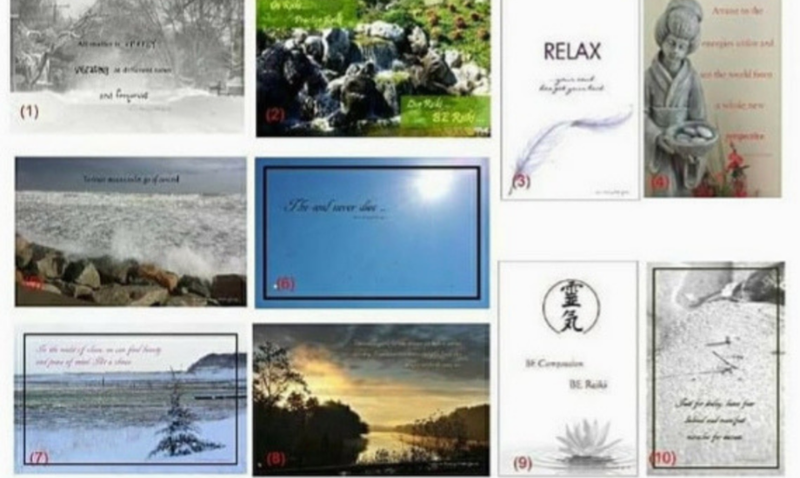 w/ purchase of 3 Reiki Sessions of equal or lesser value. 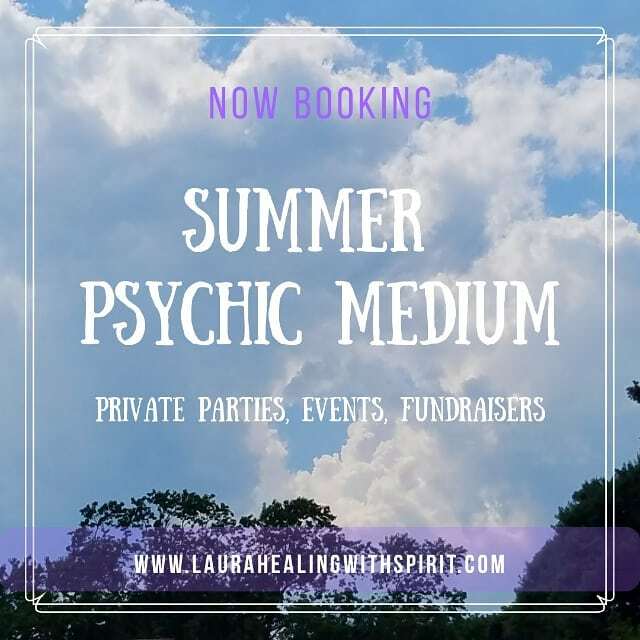 with the booking of a psychic medium party between now and January 2016. Contact us to purchase yours today. Gift Certificates can also be mailed directly to your loved one. Inquire for details today! © 2010 All Rights Reserved. A single copy of these materials may be reprinted for noncommercial personal use only. When we think of the holidays we smile with nostalgic visions of celebrations, roasting chestnuts, caroling, crackling fires, happy Cleaver-like families, and everything we asked for under the ‘ol Christmas tree. As much as the holidays bring love, holiday cheer, & family gatherings so do the winter blues, stress, anxiety, and especially the financial pressure to buy gifts, travel or entertain. For many, the holidays are the hardest time of the year – emotionally, psychologically, financially, spiritually & physically. With the economy and consumer confidence at its lowest point since the great depression, families are struggling more than ever with finding a healthy balance between work, home & personal needs. Welcome to one of the most stressful periods of the year and this year is bound to be one of the most stressful. According to a 2006 survey by the American Psychological Association, 44% of women and 31% of men report increased stress over the holidays. Stress is different for everyone and what may be stressful for one person may not be stressful for another and stress appears in many different ways. Stress is a growing epidemic taking a serious toll on our physical health, mental health, and spiritual health with the majority of Americans are living with moderate to high levels of stress according to the APA. Stress that is not managed can have dire consequences without help and change. Also the increase of depression and anxiety during the holidays as well. 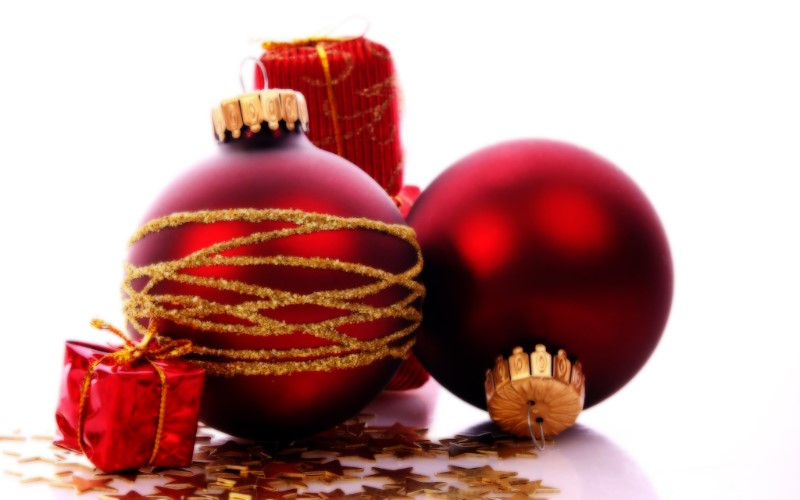 However, despite popular belief, the increase in suicides during the holidays is a myth according to Mayo Clinic. There is no avoiding stress, but there ways to better manage your stress levels. Oooooooook? So how do we conquer this holiday stress? First, in order to change the effects of your stress, you have to learn to recognize and identify when you’re feeling stressed and become more aware of the signs, symptoms, and triggers. Your body tells you everything you need to know by sending you signs and signals. Are you listening to them? Overweight Children report to be more likely to have trouble falling asleep (15%), have headaches (15%), eating too much or too little (32%), or feel angry and getting into fights (9%) than non-overweight children, which are often symptoms of stress. Money (76%), work (70%) and the economy (65%) remain the most cited sources of stress for Americans during this time of “Non” Depression. Parents report similar sources of stress citing money (80% ), work (72%), and the economy (72%) as stressors, and 73% also report that family responsibilities. The most common reason for not managing stress well enough is “too busy or not having enough time”. “Two-fifths of adults reported overeating or eating unhealthy foods because of stress in the past month”. One-third skipped a meal due to stress in the past month. More than four in ten report laying awake at night in the past month. The next step is to choose a way to deal with your stress. For instance, no matter how dire your situation, find something positive in your life to focus on and find gratitude in that. You can not change how someone treats you or what situations have been given to you, BUT you can choose how you react to them. Another way, is avoidance. However, avoiding the event or thing that gives you stress is not always possible especially if that is family. So the better way is changing your thoughts and how you react to people, things or situations. As you go through the holiday season pay attention to you – not the ego self, but the inner you! You can’t change what you can not control. So why worry? How is that going to make your situation better? Identify your triggers. Knowing what triggers your stress, gives you time to prepare and prevent toxic holiday stress from ruining your holidays. Stay positive and try to see the good in every situation. Avoid toxins such as cigarettes, alcohol and caffeine. Avoid the foods that could be making you sick. Seek alternative therapies such as reiki, meditation, acupuncture or massage therapy. Avoid conflict and try to resolve existing conflict the best you can. See every adversity as a chance to grow, excel and be better than before. Find a healthy outlet to reduce stress such as yoga, exercise, tai chi, painting, or hiking. Find balance – Your mind, body, and spirit equally need relaxation and attention. If you have health issues such as heart disease, don’t delay seeking medical attention. The delay in seeking medical attention is cited as one of the reasons for an increase in heart related deaths. Check out a few upcoming events that can help keep you balanced, increase clarity, reduce stress, and bring more love, peace, and understanding to your life. Meditation for instance has been clinically proven to reduce stress and is the oldest method for stress reduction around. The “Merry Christmas Coronary” and “Happy New Year Heart Attack” Phenomenon; Robert A. Kloner, MD, PhD; © 2004 American Heart Association, Inc.
© 2010-2014 Laura Bonetzky-Joseph. All Rights Reserved. This information is for general educational uses only. It may not apply to you and your specific medical needs. This information should not be used in place of a visit, call, consultation with or the advice of your physician or health care professional. Communicate promptly with your physician or other health care professional with any health-related questions or concerns. This article does not share the opinions of MedSpa New England. Be sure to follow specific instructions given to you by your physician or health care professional.